If you’re looking for something unique for your next eating experience, why not go big? Across New Mexico, diners, sports bars, cafes, and more, are challenging their patrons to tackle some seriously big eats. From 14-pound burritos to 12-inch tortillas, you’ll find some super big bites at these great eateries in New Mexico! The red-and-white striped exterior of this diner is like a beacon, signaling passersby to stop in for some comfort food. As with most diners, the portions are generous. The food challenge, however, is enormous. Called Travis on a Silver Platter, it’s a 14-pound burrito, stuffed with seasoned beef and beans smothered in red chile sauce, then topped with green chile, lettuce and tomatoes and then topped with a giant mass of French fries. 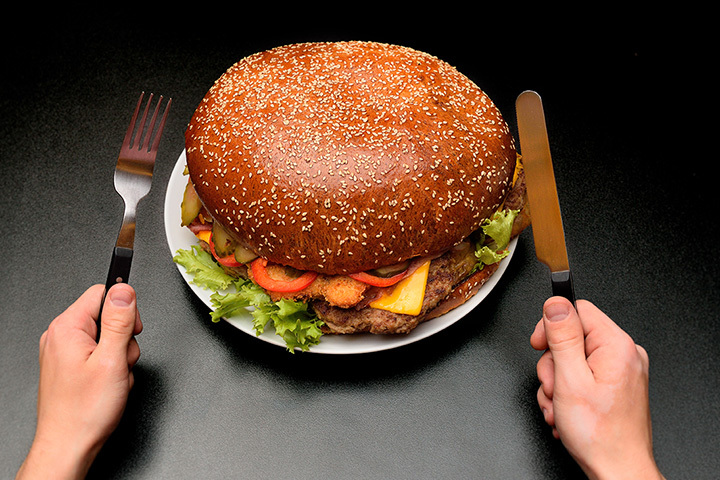 If you finish it in under an hour, the meal is free. But know this, only two people in more than 40 years have ever done that! As one of the city’s favorite restaurants for more than 60 years, Sadie’s is known for authentic Mexican food, and a lot of it. Although standard fare is generous, it doesn’t come close to the enormity of the six and a half pound, foot-wide, stuffed sopaipilla, a food challenge that few customers have successfully finished in the allotted one hour time limit. It’s chockfull of beans potatoes, chicken, beef and pork in red chile sauce. Finish in time and the meal is free, plus you’ll receive a certificate, shirt, jar of Sadie’s salsa and a picture on the wall of fame. You’ll find a renowned burger challenge here. This three-patty, cheese covered, bacon smothered, chile pecan crusted and lettuce and tomato tucked under the bun meal weighs in at three pounds. It’s served with an order of fries. If you eat all of it in under eight minutes, the meal is free—a $22 value incentive. It’s a brewery so wash it all down with one of the craft beers on-hand. We know the Corked Bat burger is great... but have you tried the fireball burger?? #ImGoingToTheGame! #BurgersAnyone?? Who doesn’t love a plate of pancakes for breakfast? How about three massive pancakes that are at least a foot in diameter each? If this challenge is calling to you, stop by the café any day between 7 a.m. and 12 p.m. and between June and November and give it a go. There’s a lot of swag on the line. If you eat all three in less than an hour you get a free meal, t-shirt, hat, mug and your picture on the wall of fame. Be forewarned. If you don’t do it, the staff will post pictures of you washing the dishes on Facebook. The alarm bell should ring when someone finishes the Fireman’s burrito here, a 10-pound cylindrical feast. It’s made up of two pounds of potatoes, 10 eggs, a half-pound each of sausage, bacon and carne adovada, plus a half pound each of chicharrones, cheese, beans, red and green chiles and three 12-inch tortillas. Time limit to finish is one hour. If you make it under the wire, you’ll get a free meal, sweatshirt, custom jacket with your name on it and a picture on the wall of fame. If you don’t, it’s a $50 tab. Another day, another belly-buster burger challenge. This one is a how-many-patties-can-you-eat stacked on a Field Good Burger? The current record is four. The meal overflows the plate it’s served on and begins with a plate of potatoes, then the burger with cheese and veggies added to the number of patties you think you can get down. On top of that are some thick fries and onion rings. Time limit is one hour. It helps to have one of their made-in-house orange soda or ginger ale. If you manage to finish, you’ll get a free t-shirt and be named the king of the challenge. Cost of the meal is $28.